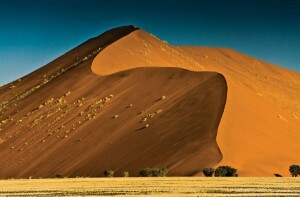 Our Namibia – 8 Days is an awe-inspiring exploration of this vast land, via air and land. Our itinerary stretches from the endless, rippling sands and towering dunes of Sossusvlei to the dolphin-filled waters at Swakopmund and Walvis Bay, through the stark plains of Damaraland and onto the Etosha Pan. Etosha, meaning ‘Great White Place’, is made of a large mineral pan, where abundant wildlife has adapted to this wild and arid landscape. This is a truly unique African experience, encompassing extremely varied landscapes and cultures, and is not to be missed. Great Safaris Namibia – 8 Days extension includes 9 nights accommodation, all meals, activities and transport between camps via light aircraft.